- Maze-like assets for procedural generation. As an added bonus we also have a built-in Main Menu Template packed with your generic single and multiplayer experience as well as a credits and unlockables menu for any extra perks you want to slide into your game. Constructive criticism are absolutely welcome. Tell me what you all think folks! Last edited by Lord Iheanacho; 03-09-2019, 08:30 PM. UPDATE: A screenshot of the main menu template. Could really use some feedback on all this. I have updated the first post of this thread. 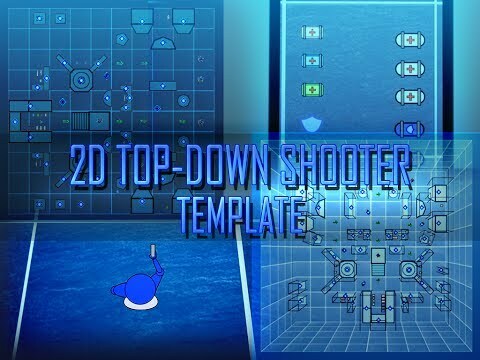 The 2D Top Down Shooter Template is finally released to the Unreal Marketplace! Let me know what you all think if and when you purchase it. Feedback is welcome and I always improve the template whenever due. Got some suggestions / feedback for this framework. Overall this looks like a very solid basis for a game. Here are some things I would like to see in the template. 1. 2D Vehicle support - It would be nice to see support for 2D Cars and Tanks. 2. Support for call-ins such as artillery for example would be a welcome addition. 3. Give the Sniper rifle additional "zoom" in the direction it is aiming to simulate aiming down the scope. Possibly restricting what the player can see to a cone while zoomed in? 4. Add Melee: If a player runs out of ammo they have something to fall back on. Thinking knife or Bayonet attached to a rifle as a few examples to get you started. 5. Throw able Grenades would also be a nice addition. Thanks HeadClot. Great suggestions I shall add in the next update (the artillery will probably have to come the 2nd next update however). Luckily I already got a head start with 2D tanks, sniper zoom, and grenades, so I will upload a video showcasing that very soon. The current video is a little outdated as the sniper rifle in the template does in fact zoom an additional view now, however it currently just expands the camera view higher so the player can see more enemies in their peripheral view, making overall aiming more easier. As for melee, I have made a slot and functionality in blueprints so I guess its only a matter of getting animations done for it and that shall be a cakewalk to complete. Expect an update to the template quite soon. Thanks TechLord ! I am actually curious to see someone remake SMASH TV with my template. Any date on a new update? Funny, you mentioned that, I have just updated the project to 4.19. I will be updating the project with network support hopefully by June 2018 or earlier. My apologies for the months delay on the major update. Long story short, the AI decide to falter and break on me when I upgraded the template to Epic Games' Special Jamaican Leaf Edition engine upgrade. Apparently that leaf was too potent for it's own good and it caused too many problems for nearly all of my projects involved. In addition to navigation system changes, there were also changes to the enum and particularly the 'now' sensitive Literal enum, which has managed to effectively hinder the behavior tree. It took me a month to even discover that the enum setup has in fact changed and was the sole culprit, I had my focus on the PawnSensingComponet and the PawnNoiseEmitter fearing both were being deprecated. For another, functions are now name sensitive so having my company's name as it's intended spelling "Néotl Empire" will no longer suffice as part of the name for my cast function wrappers. I decided to simply replace the high tone 'e' with a regular alphabetic one - now "Neotl Empire". I hope the original 4.20 update on the template did not cause too much trouble, I have now fixed the update yesterday. Even so, that only covers the delay from last month. You may be wondering, "What about the other months since June 2018 (the year a major update was suppose to arrive)?" Well, that is another long story that is also very personal and even NSFW to some extent, so to summarize it I will just leave you all with three words - retail job failures, declining health, legal trouble. But I can at least be glad that I am not dead nor in prison, and I still have a roof over my head. With such barriers out of the way, I can now finish my template as promised (even though I am now far off schedule). The major 2.0 update seeks to include full multiplayer support - multiplayer UI, game modes, and game state conditions for the game modes. Deathmatch, CTF, Control Point (aka King of the Hill), and a few other special ones. I'd rather not prefer setting another estimated date of release on my products for my 'naturally gifted' predictions have gone very rusty and unreliable since my days working on my first game, so we will just have to consider this one a "when it's done" basis, however I still intend to get this released before this year ends. Last edited by Lord Iheanacho; 12-14-2018, 10:14 AM.